Yes, there IS time for art! 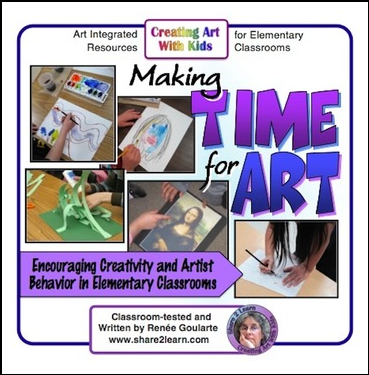 Encourage creativity and artist behavior in your classroom. Art can be included in most classroom schedules with a minimum of “extra” time taken away from other subjects. Integrating art with other subjects is one way; another way is to take a good look at some of the things we do in the classroom where art could easily be substituted. This FREE resource is full of ideas and suggestions for making time for art. Use the companion "Artist Behavior Mini-Posters" to help students learn that artists observe constantly and think and make choices throughout their creating process. Visit my blog, Creating Art With Kids, for detailed descriptions and helpful tips about the process of teaching many of my art lessons. Creating Art With Kids lessons are designed to focus primarily on the creative process. They are intended to be open-ended enough to encourage student creativity and detailed enough to give teachers clear direction. Visit my blog, Creating Art With Kids, for detailed descriptions and helpful tips about the teaching process for many of my art lessons. Like Creating Art With Kids on Facebook for inspiration and ideas for making time for art in the classroom. -- Look for the green star near the store logo at the top of the page. Click it to become a follower and receive email updates about my products. -- Provide feedback on purchased products and TpT will give you credit toward future purchases. Look in your “My Purchases” page for the “Provide Feedback” button.